Mycobacterium avium complex (MAC) consists of two species: M avium and M intracellulare; because these species are difficult to differentiate, they are also collectively referred to as Mycobacterium avium-intracellulare (MAI) . MAC is the atypical Mycobacterium most commonly associated with human disease. MAC is primarily a pulmonary pathogen that affects individuals who are immune compromised (eg, from AIDS, hairy cell leukemia, immunosuppressive chemotherapy). In this clinical setting, MAC has been associated with osteomyelitis; tenosynovitis; synovitis; and disseminated disease involving the lymph nodes, the CNS, the liver, the spleen, and the bone marrow. MAC is the most common cause of infection by nontuberculous mycobacteria (NTM) in patients with AIDS. M avium is the isolate in more than 95% of patients with AIDS who develop MAC infections. MAC lung disease occurs rarely in immunocompetent hosts. Patients with underlying lung disease or immunosuppression may develop progressive MAC lung disease. M intracellulare is responsible for 40% of such infections in immunocompetent patients. MAC is transmitted via inhalation into the respiratory tract and ingestion into the GI tract. It then translocates across mucosal epithelium, infects the resting macrophages in the lamina propria and spreads in the submucosal tissue. MAC is then carried to the local lymph nodes by lymphatics. In immunocompromised hosts, such as those with AIDS, the bacteria subsequently spread hematogenously to the liver, spleen, bone marrow, and other sites. Disseminated MAC (DMAC) infection usually develops in patients with AIDS and/or lymphomas whose CD4 count has fallen below 50 cells/µL. In patients with AIDS, colonization of the GI or respiratory tract has been associated with an increased risk of developing MAC bacteremia. Approximately 60% of patients with MAC colonization in one series developed bacteremia; however, screening cultures from the respiratory or GI tract is not useful because most patients who develop bacteremia are not colonized prior to developing disseminated disease. The most important risk factor for MAC infection in patients without HIV infection is underlying lung disease. Pulmonary disease is the most common manifestation MAC infection in these patients. It can also cause lymphadenitis in children. MAC has surpassed Mycobacterium scrofulaceum as the most common cause of cervical adenitis in developed countries. Both tumor necrosis factor (TNF)–alpha and interferon (IFN)–gamma play important roles in defending against mycobacterial infections. Like other mycobacteria, MAC can cause disseminated infection in multiple family members who have a deficiency of IFN-gamma receptor expression or IFN-gamma production due to genetic defects. MAC has also been associated with pulmonary infection and bronchiectasis in elderly women without pre-existing lung disease. Pulmonary MAC infection in this population is believed to be due to voluntary cough suppression that results in stagnation of secretions, which creates an environment suitable for growth of the organisms. This particular type of infection is also referred to as Lady Windermere syndrome (see the image below). CT thorax of a 77-year-old woman who presented with chronic cough and sputum production, without a history of underlying pre-existing lung disease. Sputum culture grew Mycobacterium avium complex. The diagnosis was Lady Windermere syndrome. MAC has been also associated with a hypersensitivity pneumonitis-like reaction (known as hot-tub lung) in patients exposed to aerosolized MAC. [3, 4] Hot-tub lung is thought to be caused by a pulmonary response to infectious aerosols of MAC. However, the roles of other organic and inorganic cofactors present in the aerosols and host predispositions have not been established. MAI also causes cutaneous disease. These infections occur by 3 separate mechanisms, which occur in unique patient populations with different morphologic manifestations. MAI infection may involve the skin primarily via posttraumatic inoculation, secondarily as a manifestation of disseminated Mycobacterium avium-intracellulare (DMAI) systemic disease, and by direct extension as a complication of cervical lymphadenitis. MAC infections are caused by M avium and M intracellulare, which are acid-fast atypical mycobacteria that belong to group III in the Runyon classification of nontuberculous mycobacteria. MAC is ubiquitous in the environment. M avium is further divided into various subspecies based on molecular, biochemical, and growth characteristics. M aviumavium is the only important subspecies associated with human infection, although M avium paratuberculosis has a possible association with Crohn disease.M avium paratuberculosis is a well-known cause of paratuberculosis (Johne Disease) in cattle, but its role in the etiology of Crohn disease in humans remains to be proven. Pulmonary MAC infection is associated with chronic lung diseases, such as chronic obstructive pulmonary disease (COPD), chronic bronchitis, bronchiectasis, cystic fibrosis, and lung cancer. It is also associated with thoracic skeletal abnormalities (eg, pectus excavatum, mild scoliosis, straight back), as may occur in people with mitral valve prolapse. MAC infection in patients with AIDS or lymphoreticular malignancies is associated with a CD4+ T-lymphocyte count of fewer than 50 cells/µL. MAC infection develops in up to half of people with AIDS. Posttransplantation immunosuppressive therapy is also a risk factor for MAC infection. Lady Windermere syndrome is believed to be associated with suppression of cough in otherwise healthy, thin, elderly women. No risk factors for primary cutaneous MAI infection or cervical adenitis are known. NTM infections began to be reported more frequently after the incidence of tuberculosis declined in the 1950s. During 1979-80, NTM represented one third of mycobacterial isolates reported to the Centers for Disease Control and Prevention (CDC), and 61% of these were MAC. MAC and Mycobacterium kansasii are two of the most predominant NTM infections in the United States . In the United States, MAC infection is considered a nonreportable infectious disease. However, CDC surveillance data from Houston and Atlanta suggest an incidence of 1 case per 100,000 persons per year. A 2009 study in Oregon estimated an annualized rate of 5.6 cases of MAC pulmonary infection per 100,000 population, with most cases (60%) affecting females. One case series revealed cutaneous involvement in 6 of 30 cases of DMAC infection. DMAC is the most common mycobacterial infection in patients with advanced AIDS. The overall prevalence of DMAC infection increased in the 1980s and early 1990s in the United States following the advent of HIV and AIDS. The highest incidence of DMAC, 37,000 cases, was measured in 1994, at the peak in the AIDS epidemic. The incidence of DMAC has declined since the adoption of highly active antiretroviral therapy (HAART). Prior to the widespread use of combination antiretroviral therapy, 30% of patients infected with HIV developed DMAC infection, whereas in a 1996 study, only 2% of patients receiving HAART, including a protease inhibitor, developed DMAC infection. The decrease in DMAC may also reflect the use of antimicrobial prophylaxis in HIV-infected patients. M avium is prevalent worldwide. A surveillance study estimated that, in France from 2001-2003, the incidence of NTM pulmonary infections in patients without HIV infection was 0.72-0.74 per 100,000 inhabitants. In 2004, a similar study in New Zealand estimated the incidence of NTM disease at 1.92 per 100,000 population. In both countries, most of these infections were caused by MAC. MAC infection has also been reported from other parts of the world, including Australia, Japan, Tanzania, and Zambia, among others. Children are at risk of developing lymphadenitis secondary to MAC infection. Elderly women are at an increased risk for pulmonary MAC disease of the middle lobe, lingula, or both (also known as Lady Windermere syndrome). Prior to the availability of newer macrolides, the life expectancy of a patient with AIDS and DMAC infection was 4 months. In a 1999 study, the median survival time was 9 months in patients treated with rifabutin, ethambutol, and clarithromycin. Although HIV-infected patients with DMAC infections still have high rates of morbidity and mortality because of their advanced stage of AIDS, those receiving antiretroviral therapy and anti-MAC treatment have a relatively better prognosis. The most common complications of DMAC infection are anemia, which may require transfusion, and weight loss. The clinical course of pulmonary MAC infection in patients without HIV infection is usually indolent. In one study, approximately 50% of patients in one study were alive 5 years after diagnosis. Treatment success rate in patients without HIV infection have ranged from 20-90% in various studies, with an average of 50-60% clinical success and 60-75% of sputum conversion rates. Patients with more extensive disease have a 90% chance of recovery and a 20% chance of relapse after treatment with anti-MAC drugs. Untreated patients with significant lung disease may develop respiratory insufficiency or weight loss. Severe disability or death may result from respiratory failure. MAC lymphadenitis in children generally has a benign course. Untreated cases may resolve spontaneously, or the affected lymph node may rupture and form a sinus tract. Provide instructions on potential adverse effects of antimicrobial medications in patients with lung disease who develop pulmonary MAC infection, as well as patients with AIDS who are receiving antimicrobial prophylaxis. AIDS patients with MAC infection should be instructed on how to recognize anemia, which can complicate MAC infection in these patients and may require transfusion. For patient education information, see the Bacterial and Viral Infections Center and Procedures Center, as well as Bronchoscopy. Nishiuchi Y, Maekura R, Kitada S, et al. The recovery of Mycobacterium avium-intracellulare complex (MAC) from the residential bathrooms of patients with pulmonary MAC. Clin Infect Dis. 2007 Aug 1. 45(3):347-51. [Medline]. Dhillon SS, Watanakunakorn C. Lady Windermere syndrome: middle lobe bronchiectasis and Mycobacterium avium complex infection due to voluntary cough suppression. Clin Infect Dis. 2000 Mar. 30(3):572-5. [Medline]. Hartman TE, Jensen E, Tazelaar HD, et al. 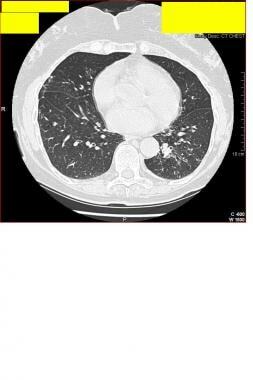 CT findings of granulomatous pneumonitis secondary to Mycobacterium avium-intracellulare inhalation: "hot tub lung". AJR Am J Roentgenol. 2007 Apr. 188(4):1050-3. [Medline]. Feller M, Huwiler K, Stephan R, et al. Mycobacterium avium subspecies paratuberculosis and Crohn's disease: a systematic review and meta-analysis. Lancet Infect Dis. 2007 Sep. 7(9):607-13. [Medline]. Koirala J, Adamski A, Koch L, Stueber D, El-Azizi M, Khardori NM, et al. Interferon-gamma receptors in HIV-1 infection. AIDS Res Hum Retroviruses. 2008 Aug. 24(8):1097-102. [Medline]. Koh WJ, Jeong BH, Jeon K, Lee NY, Lee KS, Woo SY, et al. Clinical Significance of the Differentiation between Mycobacterium avium and Mycobacterium intracellulare in M. avium Complex Lung Disease. Chest. 2012 May 24. [Medline]. Thomson RM, Armstrong JG, Looke DF. Gastroesophageal reflux disease, acid suppression, and Mycobacterium avium complex pulmonary disease. Chest. 2007 Apr. 131(4):1166-72. [Medline]. Mycobacterium avium Complex. Centers for Disease Control and Prevention. Available at http://www.cdc.gov/ncidod/dbmd/diseaseinfo/mycobacteriumavium_t.htm. Accessed: August 15, 2011. Cassidy PM, Hedberg K, Saulson A, McNelly E, Winthrop KL. Nontuberculous mycobacterial disease prevalence and risk factors: a changing epidemiology. Clin Infect Dis. 2009 Dec 15. 49(12):e124-9. [Medline]. Maugein J, Dailloux M, Carbonnelle B, et al. Sentinel-site surveillance of Mycobacterium avium complex pulmonary disease. Eur Respir J. 2005 Dec. 26(6):1092-6. [Medline]. Freeman J, Morris A, Blackmore T, et al. Incidence of nontuberculous mycobacterial disease in New Zealand, 2004. N Z Med J. 2007 Jun 15. 120(1256):U2580. [Medline]. Han XY, Tarrand JJ, Infante R, et al. Clinical significance and epidemiologic analyses of Mycobacterium avium and Mycobacterium intracellulare among patients without AIDS. J Clin Microbiol. 2005 Sep. 43(9):4407-12. [Medline]. Gordin FM, Sullam PM, Shafran SD, et al. A randomized, placebo-controlled study of rifabutin added to a regimen of clarithromycin and ethambutol for treatment of disseminated infection with Mycobacterium avium complex. Clin Infect Dis. 1999 May. 28(5):1080-5. [Medline]. Hayashi M, Takayanagi N, Kanauchi T, Miyahara Y, Yanagisawa T, Sugita Y. Prognostic Factors of 634 HIV-Negative Patients with Mycobacterium avium Complex Lung Disease. Am J Respir Crit Care Med. 2012 Mar 1. 185(5):575-83. [Medline]. Kitada S, Kobayashi K, Ichiyama S, et al. Serodiagnosis of Mycobacterium avium-complex pulmonary disease using an enzyme immunoassay kit. Am J Respir Crit Care Med. 2008 Apr 1. 177(7):793-7. [Medline]. [Guideline] Griffith DE, Aksamit T, Brown-Elliott BA, et al. An official ATS/IDSA statement: diagnosis, treatment, and prevention of nontuberculous mycobacterial diseases. Am J Respir Crit Care Med. 2007 Feb 15. 175(4):367-416. [Medline]. [Full Text]. Kasperbauer SH, Daley CL. Diagnosis and treatment of infections due to Mycobacterium avium complex. Semin Respir Crit Care Med. 2008 Oct. 29(5):569-76. [Medline]. Davis KK, Kao PN, Jacobs SS, et al. Aerosolized amikacin for treatment of pulmonary Mycobacterium avium infections: an observational case series. BMC Pulm Med. 2007 Feb 23. 7:2. [Medline]. CONVERT Study Group, Griffith DE, Eagle G, Thomson R, Aksamit TR, Hasegawa N, et al. Amikacin Liposome Inhalation Suspension for Treatment-Refractory Lung Disease Caused by Mycobacterium avium Complex (CONVERT): A Prospective, Open-Label, Randomized Study. Am J Respir Crit Care Med. 2018 Sep 14. [Medline]. Selby W, Pavli P, Crotty B, et al. Two-year combination antibiotic therapy with clarithromycin, rifabutin, and clofazimine for Crohn's disease. Gastroenterology. 2007 Jun. 132(7):2313-9. [Medline]. Kang YA, Koh WJ. Antibiotic treatment for nontuberculous mycobacterial lung disease. Expert Rev Respir Med. 2016. 10 (5):557-68. [Medline]. Lam PK, Griffith DE, Aksamit TR, Ruoss SJ, Garay SM, Daley CL. Factors related to response to intermittent treatment of Mycobacterium avium complex lung disease. Am J Respir Crit Care Med. 2006 Jun 1. 173(11):1283-9. [Medline]. Field SK, Cowie RL. Treatment of Mycobacterium avium-intracellulare complex lung disease with a macrolide, ethambutol, and clofazimine. Chest. 2003 Oct. 124(4):1482-6. [Medline]. Jenkins PA, Campbell IA, Banks J, Gelder CM, Prescott RJ, Smith AP. Clarithromycin vs ciprofloxacin as adjuncts to rifampicin and ethambutol in treating opportunist mycobacterial lung diseases and an assessment of Mycobacterium vaccae immunotherapy. Thorax. 2008 Jul. 63(7):627-34. [Medline]. [Guideline] Kaplan JE, Benson C, Holmes KH, Brooks JT, Pau A, Masur H. Guidelines for prevention and treatment of opportunistic infections in HIV-infected adults and adolescents: recommendations from CDC, the National Institutes of Health, and the HIV Medicine Association of the Infectious Diseases Society of America. MMWR Recomm Rep. 2009 Apr. 58:1-207. [Medline]. Chaisson RE, Keiser P, Pierce M, Fessel WJ, Ruskin J, Lahart C, et al. Clarithromycin and ethambutol with or without clofazimine for the treatment of bacteremic Mycobacterium avium complex disease in patients with HIV infection. AIDS. 1997 Mar. 11(3):311-7. [Medline]. de Silva TI, Cope A, Goepel J, et al. The use of adjuvant granulocyte-macrophage colony-stimulating factor in HIV-related disseminated atypical mycobacterial infection. J Infect. 2007 Apr. 54(4):e207-10. [Medline]. Pierce M, Crampton S, Henry D, et al. A randomized trial of clarithromycin as prophylaxis against disseminated Mycobacterium avium complex infection in patients with advanced acquired immunodeficiency syndrome. N Engl J Med. 1996 Aug 8. 335(6):384-91. [Medline]. Lindeboom J. Conservative wait-and-see therapy versus antibiotic treatment for nontuberculous mycobacterial cervicofacial lymphadenitis in children. Clin Infect Dis. Jan 15 2011. 52(2):180-4. [Guideline] Haworth CS, Banks J, Capstick T, Fisher AJ, Gorsuch T, Laurenson IF, et al. British Thoracic Society guidelines for the management of non-tuberculous mycobacterial pulmonary disease (NTM-PD). Thorax. 2017 Nov. 72 (Suppl 2):ii1-ii64. [Medline]. Ichikawa K, van Ingen J, Koh WJ, Wagner D, Salfinger M, Inagaki T, et al. Genetic diversity of clinical Mycobacterium avium subsp. hominissuis and Mycobacterium intracellulare isolates causing pulmonary diseases recovered from different geographical regions. Infect Genet Evol. 2015 Oct 2. [Medline]. The authors and editors of Medscape Reference gratefully acknowledge the contributions of previous author William B Harley, MD,to the development and writing of the source article.